ABOUT US: WHAT IS STYLE DOTS? Style Dots is a brand new company that offers a line of customizable jewelry that you can change to match your everyday style. Have you ever wondered how some people who are part of a new party plan business are making a lot of money in just a few years? Wouldn't you like to look back and be one of them? Or are you just looking to make some extra money with a company that values your ideas and inspiration? Join me today on this AMAZING journey and help make a difference in the lives of others. * We are a transparent company * Style Dots was founded by well known direct sales leaders * We believe in you and want to empower you to make a difference * Our Independent representatives are Boutique Partners * 40% Discount * FREE Monthly items * Be the first in your state to become a Founding Boutique Partner with Style Dots! Contact me today for more information on how you can start your own business today. ABOUT US: Style Dots is now in Alaska! 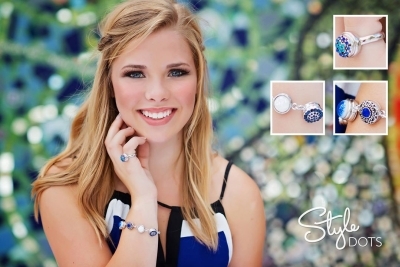 Style Dots is a new direct selling company that offers unique jewelry. You can customize your jewelry to match your style everyday just by changing out your dots. Jewelry will not be the only product line Style Dots ventures into. You will find Style Dots is going to be a boutique type company, the best is yet to come. Looking to earn a good amount of income or build your own team? Well Style Dots can help you out. With 3 founders that have built multi-dollar sales team, they know the industry. ~ 40% Instant Commission (ON EVERYTHING - upfront) ~ FREE Training ~ FREE Monthly Items ~ A compensation plan with only 5 levels never loose your rank. If your ready to join the newest Direct Selling Company with owners that care about their Partners then contact me today. FACEBOOK: Visit my Facebook Page! ABOUT US: Style Dots is an amazing company that has recessed patent pending customizable jewelry and accessories that you can change to match your everyday style. Have you wondered how some people can be part of a new party plan business and make a lot of money in just a few years? Wouldn't you like to look back and be one of them? Or are you just looking to make some extra money with a company that values your ideas and inspiration? Join me today on this AMAZING journey and let's make a difference in your life and the lives of others. * We are a transparent company * Style Dots was founded by well known direct sales leaders * We believe in you and want to empower you to make a difference * Our Independent representatives are Boutique Partners * 40% Discount * FREE monthly items * If you are ready to make a difference and be your own boss, contact me today for more information on how you can start your own business today. ABOUT US: Whether you're looking for a way to make money, meet new friends or just have fun, Style Dots is the perfect opportunity to help you do all three! Style Dots is a fairly new company that currently offers unique, stylish, boutique items such as customizable jewelry, handbags and hair accessories, with plans for so much more! This is the perfect time for you to get in on this amazing journey! Still a ground floor opportunity! 40% instant commission on most items, plus potential for much, much more! Our company is growing fast and I'd love to talk to you more about it! If you think Style Dots would be a good fit for you and your life, don't hesitate to contact me! ABOUT US: STYLE DOTS is a brand new company that offers a line of unique, customizable jewelry that you can change to match your outfit, your mood , even your favorite sports team colors! Join me today on this AMAZING journey and help make a difference in the lives of others. * We are a transparent company * Style Dots was founded by well known direct sales leaders who believe in you and want to empower you to make a difference * Our Independent representatives are Boutique Partners & receive a 40% commission from the start! * FREE Monthly items * Be one of the first in your state to become a Boutique Partner with Style Dots! Contact me today for more information on how you can start your own business today. ABOUT US: Style Dots is a new direct selling company that offers unique jewelry. You can customize your jewelry to match your style everyday just by changing out your dots. Jewelry will not be the only product line Style Dots ventures into. You will find Style Dots is going to be a boutique type company, the best is yet to come. Looking to earn a good amount of income or build your own team? Well Style Dots can help you out. With 3 founders that have built multi-dollar sales team, they know the industry. ~ 40% Instant Commission (NOW on everything) ~ FREE Training ~ FREE Monthly Items ~ A compensation plan with only 5 levels never loose your rank. If your ready to join the newest Direct Selling Company with owners that care about their Partners then contact me today. ABOUT US: WHAT IS STYLE DOTS? Style Dots is a brand new company that offers a line of customizable jewelry that you can change to match your everyday style. Have you ever wondered how some people who are part of a new party plan business are making a lot of money in just a few years? Wouldn't you like to look back and be one of them? Or are you just looking to make some extra money with a company that values your ideas and inspiration? Join me today on this AMAZING journey and help make a difference in the lives of others. * We are a transparent company * Style Dots was founded by well known direct sales leaders * We believe in you and want to empower you to make a difference * Our Independent representatives are Boutique Partners * 40% Discount * FREE Monthly items * Be one of the first in your state to become a Boutique Partner with Style Dots! Contact me today for more information on how you can start your own business today. ABOUT US: Style Dots is a new company featuring customizable jewelry and accessories. Change your pop-in "dots" to match your mood, outfit, event, or to tell your personal story. If you're looking for a way to make money, meet new friends, or just have fun, Style Dots is the perfect opportunity to help you do all three! There's no time like the present to join me and our amazing founders in this ground floor opportunity. Our independent consultants, called Boutique Partners, receive 40% instant commission, FREE monthly items with potential for much more, and have a voice that is heard. You will have access to free training and support to ensure you not only make money but also keep it with online classes, Facebook groups, webinars, and phone calls. If you are ready to make a difference, set your own hours, be your own boss, and have FUN, contact me for information on how you can start your own business today. ABOUT US: Style Dots, a new direct sales company, offers interchangeable jewelry to match anyone's style. You start with your base and then change the dots to match any outfit. Style Dots is growing rapidly and it's a great time to become an Independent Style Dots Boutique Partner. You can earn a 40% discount and free dots. Contact me today for more information.